When Should We Talk About Mid-Terms? The warnings come when autumn approaches: “Don’t talk about politics at Thanksgiving”, we are told, because Grandpa is not going to agree with Uncle John and we don’t want sweet potatoes flying around the dining room. Talking politics has always been a dicey decision, but the topic has become so divisive in America that everyone approaches political conversation carefully, and many people avoid it altogether in public and social settings. But for investors, the politics of today matter. With mid-term elections coming in November, the entire population of the House of Representatives could turn over (in theory), and the results of several key Senate races could impact the makeup of the upper branch of the legislature as well. Should investors discuss politics with their advisor? That is up to the two people involved in the conversation, of course. But advisors should have an opinion about the possible effects mid-term elections can have upon investments and should share those concerns with their investors, probably before the effects take place. 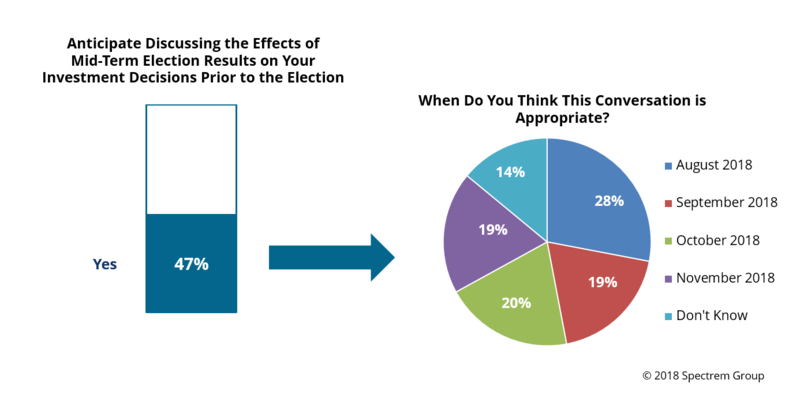 As part of its monthly survey of investors with a net worth of at least $100,000 (not including primary residence), Spectrem asked investors in July whether they feel the need to discuss the possible impact of the mid-term elections with their advisor. Indicative of the power of politics in the world today, 47 percent of investors said they anticipate having that conversation. The Spectrem research segments investors by several parameters, and investors who are Senior Corporate Executives and Information Technology were more likely to want to have that conversation. It makes sense that Senior Corporate Executives would want to understand the potential impact since there is a clear divide between political parties and their attitude toward corporate tax and revenue issues. At the same time, businesses involved in information technology are the leaders in valuation these days and political matters could impact revenues as well as employee wages and costs, creating a new investment question to be answered. When investors were segmented by political party, however, it was Democrats (61 percent) who wanted to talk about the impact of the mid-term elections on their investments more than Republicans (only 34 percent). There was also a clear difference in investor opinion based on age. Younger investors, who are most likely to be promoting the idea of change in political outcomes, expressed almost universal interest in discussing mid-terms with their advisors (77 percent). As investors were older, their interest in such conversations was much smaller by percentage. How much lead time do investors want to consider changes in regulations and the investment atmosphere which may occur from mid-term election results? In today’s topsy-turvy political climate, making plans too far in advance could backfire, but of those investors who want to discuss political ramifications with their advisor, almost 30 percent want to have those conversations as soon as possible. Nineteen percent think September is a good time to talk, 20 percent want to wait until October, and 19 percent plan to wait until elections are immediately due, or perhaps sometime after, to discuss what is about to happen or what just happened in the elections. Responses to other questions on topics of immediate interest and concern among investors are available on Spectrem’s Investor Profile Tool, an online service which provides in-depth insights into the attitudes and behaviors of investors on topics related to investment decisions. This one is easy. While it might seem difficult or invasive to discuss politics with an investor, talking about the ramifications of an election upon investment options is not only wise, it should be inoffensive to investors. After all, you are just trying to make certain an investor’s portfolio properly sets up for maximum return within the parameters set by government regulators.